Add an appointment button to your menu. This will make the customers reach it at any page when viewing you site. It opens up a fullscreen form for an appointment that will go directly to your email. This presents a powerful feature for your site. Display you main info (working hours, phone number, email address, ..) directly in the header. This will make you “reachable” from any page on your site. Create a home page using the new Revolution Slider (included in the theme files). Show your main services so that the customers see them on there first view. Add a gallery, some of your news, your partners and much more. Like on all pages, you have “free hands” designing the page as you want it. Point out your staff and a description about your spa/wellness. Using all sorts of shortcodes there are no limits what can be created. Do also point out your special offers and testimonials on what customers think about your services..
Show all you treatments with its own shortcode. You can adjust the number of columns to be visible in one line. Create single pages for all services to make a detail description about them. Create as many galleries as you want. Combine them into groups of your work so that you really point out the best of you. All galleries go to a fullscreen pop up. Post can be presented with a standard blog design that will let you update your customers. Tell them what is coming, what can they expect. Keep the interaction with your clients. Point out you location, where you can be found. Present your working hours and your contacts. 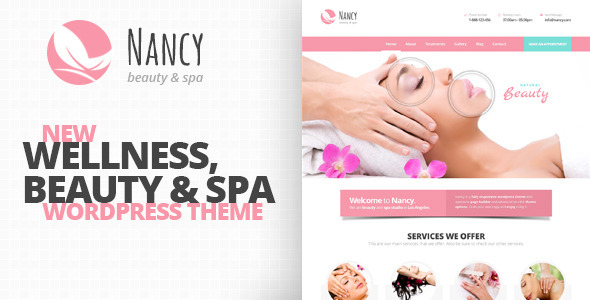 Nancy Wordpress Theme is full responsive. It suits for every view. It fits perfectly to all monitors, mobiles, tablets and support all browsers. The display on each resolution will be optimised for it, so you can the most out of every screen/resolution. General settings: backgrounds, main colors, fonts, ..